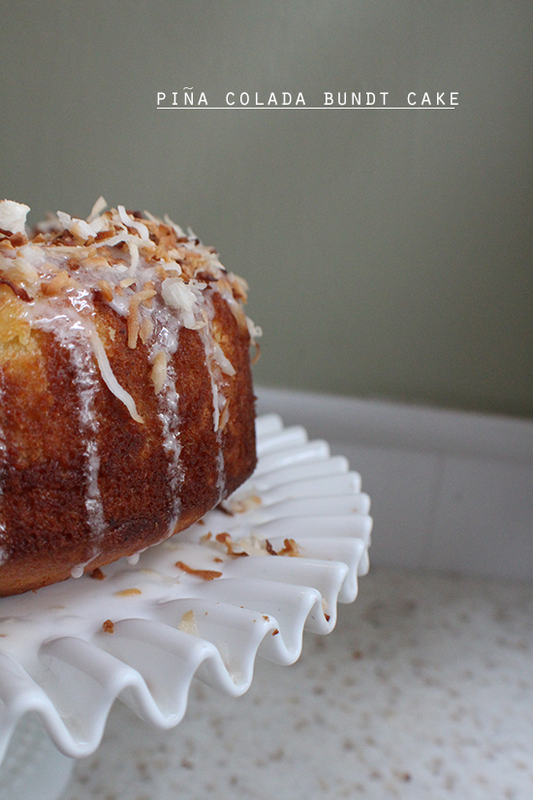 If you like pina colada… cake. And now for something completely different! 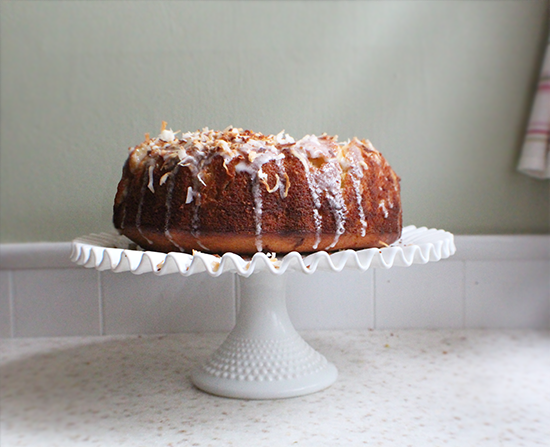 Pina colada cake! I know, random. I got tired of all the fruity stuff going on around here, guys. I needed to bake something that wasn’t a fruit tart. I’m serious. I love making jams and baking pies and tarts, but I’m really just biding my time waiting for #pickleseason and looking for opportunities to make cupcakes. So when my dad informed me he wasn’t going to pick a dessert for Father’s Day, he was going to leave it up to me, I immediately thought: cake. Then Jay came up with this genius idea. GENIUS. Totally genius. Except of course we were not the first ones to think of such a thing. I found an excellent recipe and adapted it just a liiiiiittle teeny bit to suit me. And it was amazing. AMAZING. 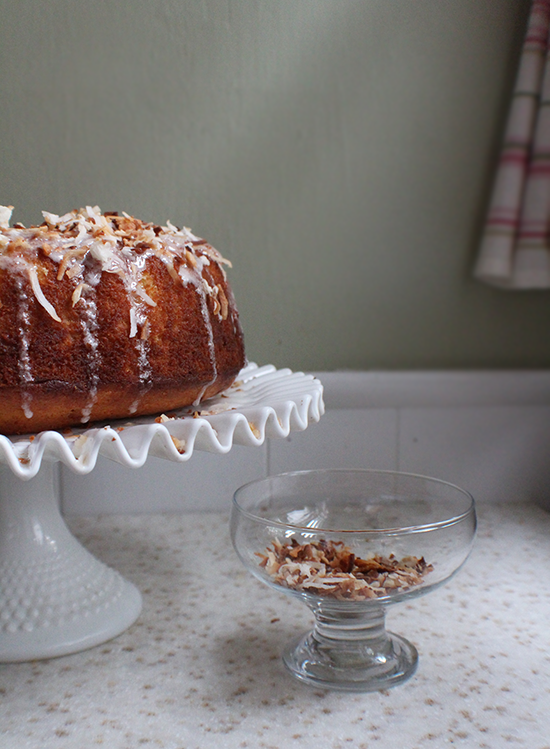 I even busted out my large Wilton bundt pan for this! Cool cake in the pan for 10 minutes. Invert cake on to a cooling rack and cool completely. Place a sheet of parchment paper under the cooling rack. Pour or spoon the glaze over the cake. 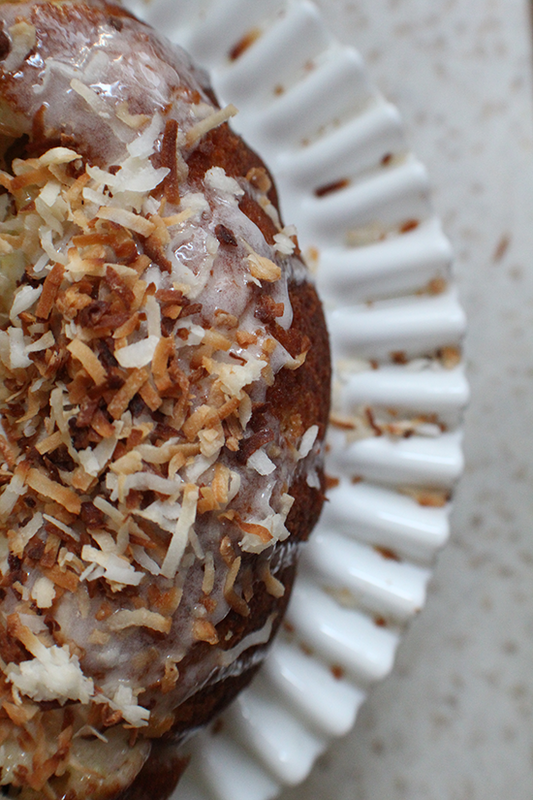 Garnish with toasted coconut. Whisk together 1 cup sugar with 1/2 cup coconut milk & 1 tablespoon rum. Add more sugar/milk/rum until desired consistency is reached. You guys, this cake is bananas. 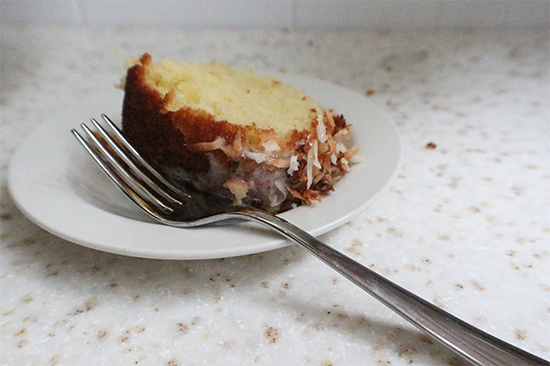 I mean, it’s pineapple and coconut… but the flavor is BANANAS. As in RIDICULOUS. But guys- this is a party cake. A birthday cake. A cake for when you’ve got a lot of people to serve, or a very deserving person to give it to. ‘Cause see, I made it for just my dad, but we all had some, ’cause he’s good at sharing. And he also knows when he’s beaten. And when presented with a cake of this size, everyone feels beaten. Unless you’re one of those Coney Island hot dog eating contest winners who can eat like, 6 tons of food and not bat an eye. Sources & credits: milk glass cake stand; vintage Fenton, footed glass dessert cup; Crate & Barrel. Previous Post Green tea + Jasmine cherry preserves, for our independence. Next Post Surprise in the garden: Black swallowtail caterpillars! Looks delicious! What kind of coconut milk did you use? I used the canned stuff from Trader Joe’s. Just plain unsweetened coconut milk! I am really delighted to read this blog posts which carries tons of valuable data, thanks for providing these kinds of information.